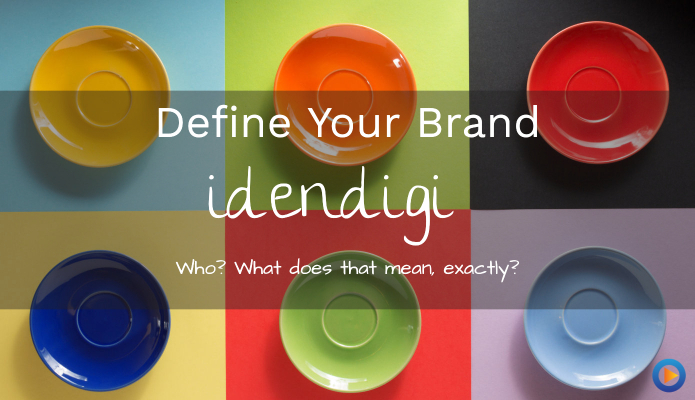 Defining Your Brand Idendigi? What Does That Mean, Exactly? Defining Your Brand Idendigi? Idendi… Who? What Does That Mean, Exactly? If you handle the marketing aspects of your own business, you’re probably used to hearing bizarre buzzwords by now like identigi. In fact, it probably seems like there’s an entire field of people out there whose only job is to make up words. Then you have to learn these new words so you can explain to other people in order to make it sound like you’re on the cutting edge. The latest such buzzword is idendigi. While it might sound like the name of a wizard in a kid’s show about friendship, the idea behind this term is useful for businesses. What Does “Idendigi” Mean In Plain English? The word idendigi is a branded form of the word identity. That specific idea is, in short, your brand identity. Your brand identity is a distilled form of what your business is about, and what makes it unique in the eyes of your customers. What do people think of when they see your logo or hear your name? What traits are associated with your business? Or, if you want to take the exercise a little bit further if your business was a person, how would your customers and potential customers describe them? All of these things are aspects of your brand identity, in much the same way that a person’s hair color, mannerisms, turns of phrase, or habits is a part of their identity as an individual. For example, what do you think of when you picture Nike? Well, if it was a person, you’d likely think of them as an athlete. Someone who puts in the time and effort to make sure they offer quality and who seizes the initiative. Traits that, if you wore their gear while you were working out, would be associated with you as well. What about a company like Costco? Well, you probably picture them as a frugal person who gets the most for their money, and who is concerned about the environment. Again, traits that customers share, if they choose to shop at Costco rather than at another big box store for their grocery needs. This attention to detail and management of your brand gives you an edge over competitors. Because when people can identify aspects of your business that they wish to make part of their own identity by emulating you, you’ve established a relationship with them. And once that relationship becomes a habit, it can be a very difficult bond to break. Take a moment to think about what some of your unique selling points are, as a business. For example, do you offer products your competitors don’t? Do you have a guarantee on your goods and services that no one else has matched? Or are you a local business, offering the kind of community belonging that big, corporate stores just can’t provide? Your branding, and creating your identity, is just taking this idea of a USP to the next, logical level. Stop and think for a moment; what are the most positive aspects of your business that you want people to associate with you? For example, do you want people to think of you as the place to go to find a bargain? Do you want them to think of you as professionals who go the extra mile to make the customer happy? Or do you want to be seen as the hip, new place that always has the latest in terms of what’s cool in your particular market? These associations don’t just happen by accident; you have to put in the effort to shape the impression you give, and how your customers and potential customers think of you. That’s why it’s important to know how you want people to think of your business, and to shape your marketing and policies to give the proper impression. Everything from your business blog to your online website, to the color scheme and design of your ads, needs to be geared to fit with the image you’re building. If clothes make the man, as the old aphorism goes, then it’s the marketing that makes the business. And the better a handle you have on who you want your customers to see when they look at you, the greater the insight you’ll have when it comes to picking out the proper clothes you want your business wearing in your future branding. When it comes to creating your unique idendigi, it can sometimes feel like you have set yourself a truly Herculean task. After all, you need to figure out what aspects of your business to emphasize, and then you need to decide how you’re going to bring those across to every customer you interact with, and to all of the potential customers who come across your ads, your social media, any content you put out as a business… it’s enough to make your head spin! That’s why it’s often a good idea to seek out someone who can help turn your brand from what it is today into what you’d like it to be tomorrow. Someone who has the expertise to help guide and mold your marketing efforts, who can advise you on the best courses of action to take, and who will work with you in order to make sure that the steps you’re taking are going to get you where you want to be. An idendigi personal trainer, if you will. Someone who’s only goal is to get you across that finish line so you can best position yourself within your market. If you need that kind of help, don’t worry, the experts you need are no more than a simple phone call away! If you have questions you need answers to, or you just want more information about how you can get your very own idendigi strategy up and running as soon as possible, all you have to do is contact us today.